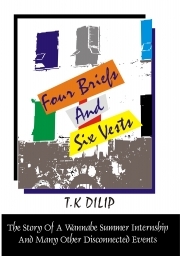 Description of "Four Briefs and Six Vests"
Four Briefs and Six Vests is a narration of a series of real life events that an IIM graduate encountered during his two month summer internship period. More often than not, people in the outside world think about MBA's and particularly IIM grads to be brilliant, emotionless, smart and professional individuals. Yes, there are such individuals who personify the dream pin striped, laptop wielding MBA discussing bonds and derivatives - but they are restricted to about 10 % of the IIM population. The rest of us are very similar to humans outside our hallowed campuses. Read our story! Reviews of "Four Briefs and Six Vests"